Give us your best shot! 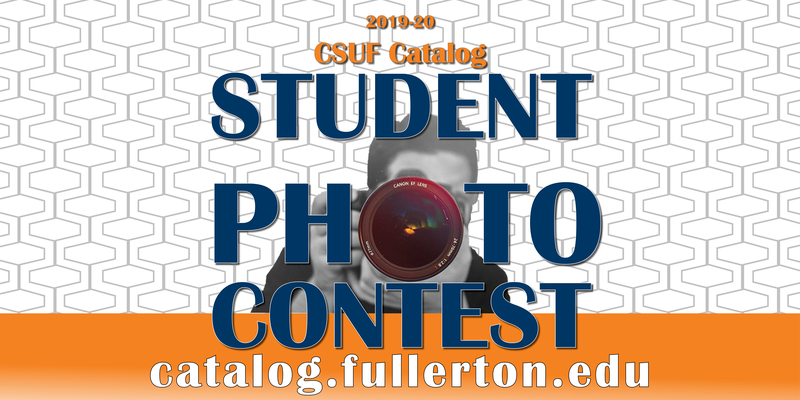 Your photo may be featured in the 2019-2020 CSUF online catalog. We want you to help capture Cal State Fullerton in all its diverse aspects of life as a Titan. Photographic entries must have been shot by the entrant from Jan. 1, 2018 to March 15, 2019, on the Cal State Fullerton campus. Only online entries will be accepted and must be in jpg format (minimum 2MB). By submitting your photo(s), you give Cal State Fullerton permission to use it/them in the 2019-2020 online university catalog. Enter photographs by submitting them to the Contest Dropbox. Label each photo: First Name Middle Initial Last Name. If submitting more than one photo, number each subsequent entry, e.g. JaneVJones1, JaneVJones 2, etc. Judges representing the Daily Titan, photojournalism, creative photography and athletics will select photos based on originality, quality, artistic merit and how well they represent/capture Cal State Fullerton. Final selections will be featured in the 2019-2020 online university catalog with the photographer’s name. Photos may be cropped or resized in order to be accommodated by the catalog. Email catalog@fullerton.edu, write "2019 Catalog Photo Contest" in the subject line.